Thousands of people in the Bay Area were alerted to an Amber Alert out of San Diego last night by a loud beep, buzz or shriek that came through their cell phone. The sound didn't stop until you answered it. Monday night's nationwide Amber Alert was sent out because investigators in Southern California decided a case involving a 40-year-old man suspected of killing a woman and making off with her two children warranted everyone to be on the look out for his car, which is a blue Nissan Versa. Latest on the search for children here. Even members of the California Highway Patrol were startled by the alert. "When my phone went off last night - yeah, it caught me by surprise," CHP spokesman Chris Falkowski said. The alert came through the Wireless Emergency Alerts Program which is sent out to all cell phones whether you sign up or not. Wayne Springfield, with got the Amber Alert on his phone, said the fact that it caught people attention means it work. "We should’ve been doing that from the beginning when phones were in the system ," Springfield said. Wireless Emergency Alerts were first introduced in 2012. They aim to reach citizens through the device they carry with them everywhere they go: their phones. They are meant to be used sparingly so as not to create what Josef called a “car-alarm syndrome,” in which users tune out the warnings. Some people reported being put off my the alert asked CTIA, which manages the texts, how to opt out. Others asked that the Amber Alerts be easier to access and more informative. Last night's alert said it came from Boulevard, which is a little town between San Diego and MexiCali. If you would like more information on the CTIA, click on this link. 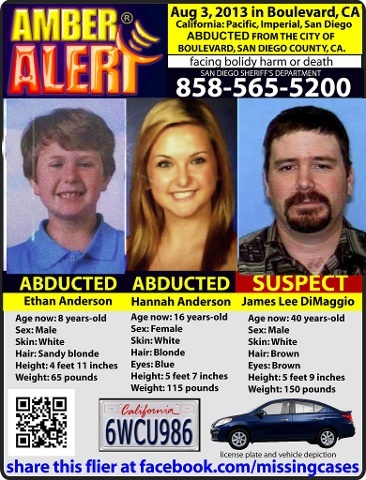 Amber Alerts that meet the U.S. Department of Justice's criteria to help law enforcement search for an abducted child. The alert program was created by the Federal Communications Commission (FCC) and Federal Emergency Management Agency (FEMA), and executed by CTIA-The Wireless Association. And is executed by wireless carriers on a voluntary basis. Law enforcement and government officials are responsible for sending the alerts. Monday night’s notice was activated by the California Highway Patrol’s Emergency Notification and Tactical Alert Center, according to the a news release.